We’re thrilled to welcome everyone to St. Paul’s, from the youngest to the oldest. Everyone is welcome! We pray that God will open to you the unexpected. No experience is required, and your questions are most welcome and encouraged. We invite you to come whenever you’re able. We’ll miss you when you’re not here and look forward to your return. Please don’t hesitate to ask for help in finding your way through the various parts of the service. It can be confusing, especially if you’re new. We are all happy to help make your time comfortable and meaningful. The sermon is the opportunity for reflection on the readings of the day and how they are relevant in our own time. They are meant to inspire, question, challenge and encourage us in our journey of faith. They can be part of a series related to a particular theme. We stand together as our response to having heard God’s Word and reflected on how it applies to our lives. This is a statement of faith we make together about who we are and what we believe using either the words of the Apostles Creed or the Nicene Creed. Prayers are offered by a member of the parish for the church, for the world, for governments, for the sick and any in need. We pray for particular needs that people have asked us to remember and for things that are happening in the news, locally or around the world. We confess that we don’t always live as God would want us to in our relationships with each other or those around us. We pray for forgiveness and ask for God’s help to be more faithful going forward. We then hear words of assurance that we are forgiven by God. As we sing a hymn, the sidespeople pass an offering plate. 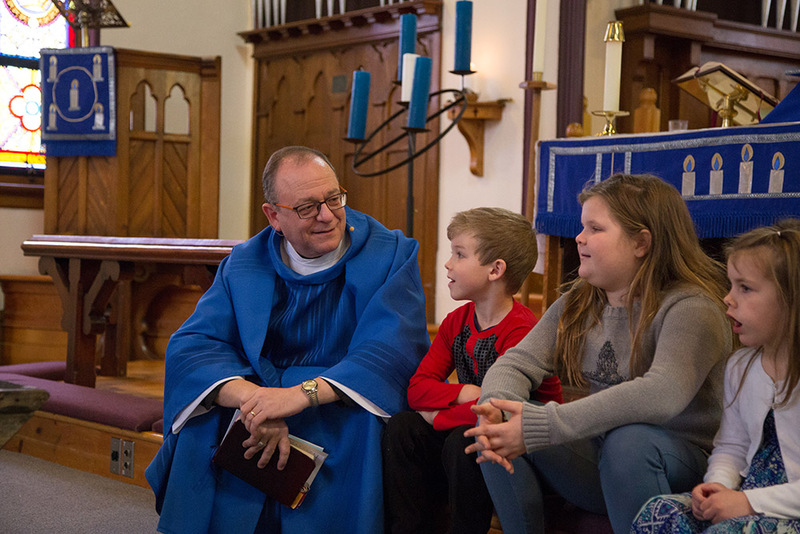 You’re invited to make an offering that supports the ministry at St. Paul’s and the church in our Diocese, throughout the Anglican Church of Canada and around the world. Be assured that if you’re not able to make an offering, we don’t expect it of you. We’re happy that you’re worshipping with us. At the time of communion, you’re invited to come forward to the altar rail to receive communion if you so desire. Please stand or kneel, whichever is most comfortable and meaningful for you. You first receive the bread by holding out your hands to the one administering, and then the person administering the wine will come to you. If you don’t wish to drink from the common cup, you may place your hand on the base of the chalice as it’s offered to you. Communion in one kind (either the bread or the wine) is considered to be complete. Hand sanitizer is provided on the front row of seats if you wish to use it before receiving communion. After communion, there are prayers of thanksgiving and a blessing. Following the closing hymn and dismissal, the worship is finished. We hope you’ll join us for a time of coffee, tea and fellowship together following the service. How can I be involved in worship? 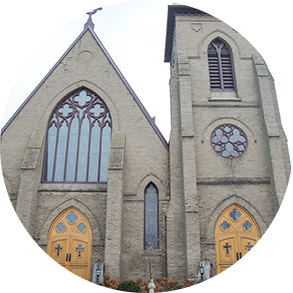 Sidesperson: greets people as they arrive, provides the bulletin and prayer book for the service, helps people with directions to seating, washrooms, etc. We value children as a sign of life, and we include them as an integral part of our worship. The choice is between you and your children whether they’d like to stay in church or go to Sunday school downstairs. You’re free to join them if that’s more comfortable for you or them. There are colouring books and crayons at the back of the church if your child would enjoy this activity while in church. The service begins with a children’s time at the front of the church. Parents and grandparents sometimes come with their child. During the announcements later in the service, the kids share with the congregation what they’ve done in Sunday school that day. Our early service is an intimate and quiet worship liturgy using the traditional prayer book of the Anglican Church of Canada, the BCP. It includes a sermon to inspire reflection on the readings of the day. Members of the congregation sit where they feel most comfortable and join in as they feel comfortable. For the 8:30 am service, copies of the service leaflet along with a BCP (prayer book) can be picked up at the back of the church. Please take a seat wherever you’re most comfortable. The service begins with prayers that gather us together, followed by the scripture readings for the day. A sermon is shared, reflecting on the readings and their relevance today. We say the creed together, and then the altar is set for communion. Prayers are offered for the church, the world and those in need, followed by the confession and absolution. The priest leads in the great thanksgiving, when the bread and wine is consecrated for communion. As you come to the altar rail for communion, there is a collection plate at the front for you to place your offering. You are encouraged to contribute as you’re able. To receive the bread, please hold your hands out; and for the wine, please help the administrator guide the chalice to your lips. If you don’t wish to drink from the common cup, please place your hands on the base of the chalice as it’s offered to you. Communion in one kind, either the bread or the wine, is complete. You may respond to receiving your communion by saying “Amen.” The service concludes with the Lord’s Prayer and a blessing. We gather with a desire to pray and sing our praises to God with both traditional hymns written over the centuries and contemporary music composed more recently. We listen to God’s word in scripture, reflect on how it relates to our lives and the world today, and share in the sacrament of Communion. This service uses the more modern liturgies from the Book of Alternative Services. The children are included in the beginning of the service, including a children’s talk, before they go to Sunday school. They return to share in communion with their families and present to the congregation during the announcements what they’ve learned in Sunday school. Following the service, we gather downstairs in the parish hall for coffee hour, sharing in conversations, fellowship and the opportunity to introduce ourselves to any newcomers. 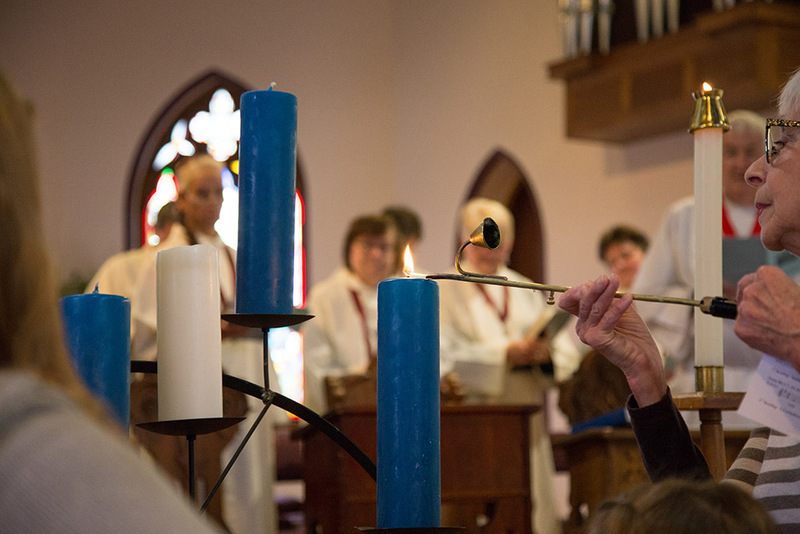 On the third Sunday of each month, the music is led by a group using a variety of instruments and offers an alternative style to our usual music. For the 10:30 am service, sidespeople will be at the entrance to our worship space to greet you and welcome you to St. Paul’s. They’ll give you a copy of our weekly bulletin and a BAS (prayer book). Sit where you feel most comfortable. Before the service begins, music is played as we’re encouraged to enter into a time of quiet prayer and reflection in preparation for our worship. The service is projected at the front of the church. This includes the various prayers and scripture readings. You’re welcome to follow along in a BAS if that’s easier for you. The hymns are usually from the blue “Common Praise” hymn book or provided on an insert. We have listening devices for those who find it hard to hear. Please ask the sound technician at the back of the church and they can provide you with one. We generally stand when we sing hymns and either kneel, stand or sit when we pray. During the reading of scripture, we sit for the first two readings and stand for the reading of the Gospel. But please stand or sit throughout the service as is easiest and most comfortable for you. A quiet, informal service in the chapel area at the front of the church. It’s an intimate opportunity mid-week to be fed spiritually. Communion service with music, followed by lemonade on the lawn. Leading up to Christmas and Easter, during the seasons we refer to as Advent and Lent, we have weekday Candlelight Communion services. They are quiet, meditative and include contemplative music with only candles for light. Festival celebrations each year include Christmas, Easter, All Saint’s Day, the Feast of St. Paul and Pentecost. Please contact us about baptisms, weddings or funerals. We’re happy to journey with you through these important moments in your life.